Sorry, but after spending the last six days studying for the exams I've had this week, I'm a little burned out. I think Sarah summed it up perfectly with her comment: Mistake? Maybe. Worth it? Oh yes. Cramming for finals will commence tomorrow, but as far as tonight goes, I will be spending it catching up on blogs and watching the Food Network. 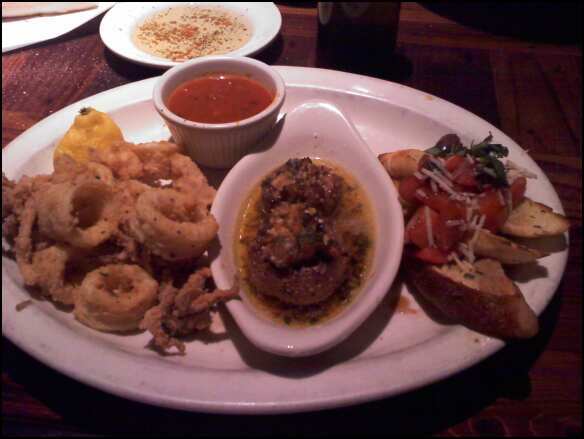 And then I rolled with Papa's Trio for my entree, which came with calamari, crab-stuffed mushrooms, and bruschetta. 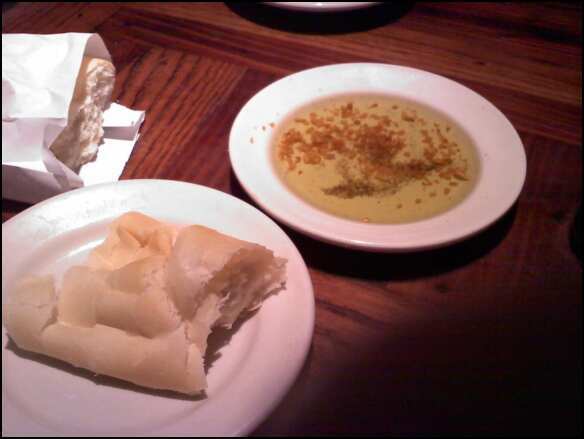 It was really good, but I didn't like how the bread got soggy from the bruschetta. I prefer it on the side. Yeah, totally the same as chocolate cake. Time to go catch up on some of your lovely blogs and then I'm hittin' the sack because I've got a 5K in the morning! My personal goal is 31:30. It's about a minute faster than last month's PR of 32:39, and last Sunday when Melissa and I ran 4.0 miles we hit the 5K mark right around 31:30. I just gotta do it again! Anyone else spending their weekend studying for finals? Running any races? Doing anything FUN?! Please tell me about your plans so I can be jealous. What's your best tip for dealing with your sweet tooth without giving in? I don't drink pop very often, but I usually keep some diet root beer in my fridge for nights when I really want dessert and I'm trying not to eat it or I've already gone way over my calorie budget for the day.